Listed below are a few helpful resources which you may find useful. Do not reuse any disposable clothing or masks used when working with asbestos or take your overalls home. Do not do anything that might disturb asbestos and cause asbestos fibres to be released in the air – so do not use power tools, cut or saw asbestos or sweep up asbestos dust or debris. Do not eat, drink or smoke in the asbestos work area. Do call in an expert if you are in any doubt as to whether a material might contain asbestos before you attempt to work with it or remove it. Do use personal protective equipment (PPE). Do wash before taking breaks and finishing work. Do call JMP Services if you need any help or advice with any issue relating to asbestos management. Asbestos is a natural fibrous mineral form of impure magnesium silicate with separable, long, and thin fibres. It has been used for around 150 years for fireproofing and insulation because of its durability, heat and chemical resistance. The strength and flexibility of the fibres enabled it to be spun and woven for use in a wide range of industrial applications. There are two general types of asbestos, amphibole and chrysotile. Amphibole comprises five different varieties with the characteristic of having relatively brittle crystalline fibre. The two most common forms that have been used commercially are Amosite (brown) and Crocidolite (blue). Chrysotile (white) is a serpentine mineral and has long and flexible fibres. Although all types are dangerous the amphibole form is the most hazardous type of asbestos as the fibres are believed to stay in the lungs longer than chrysotile and are therefore more harmful to the body. This type of asbestos can only be identified properly in a laboratory. Irreversible scarring of the lungs caused by inhaling asbestos fibres. Materials containing asbestos cement for example vinyl or thermoplastic floor tiles, bitumen roofing materials, certain textured coatings, gutters, rainwater pipes and water pipes. It is estimated that ARDs kill over 3000 people a year in the UK. They are currently the biggest work related killer and numbers are expected to increase over the next twenty-five years before declining. The time lapse between first exposure and diagnosis can be anywhere between fifteen and sixty years. It is not known what level of exposure causes diseases only that the more fibres breathed in the greater the risk to health. ARDs include asbestosis, lung cancer and mesothelioma. The process of sealing asbestos, preventing the release of fibres, by the application of an airtight material over or around the asbestos containing material (ACM). Cancer of the lining of the lungs or stomach caused by inhaling asbestos fibres. Q. I have found asbestos in my roof but it’s the non-hazardous type, what should I do? A. All asbestos is hazardous; some types are more hazardous than others. You must take advice from an expert to correctly identify the type of asbestos you have found. The Control of Asbestos Regulations 2006, which came into force in November 2006, consolidates three separate pieces of legislation relating to the control, licensing and prohibition of asbestos. The aim of the regulations was to simplify the existing legislation, making it easier for people to determine when asbestos needs to be removed by a licensed contractor; this decision is now based upon the potential risk. The Health and Safety Commission is the organisation responsible for health and safety regulation in Great Britain. The Health and Safety Executive and local government are the enforcing authorities working in support of the Commission. The aim of the HSE is to protect people's health and safety by ensuring that risks in the changing workplace are controlled properly. There is a section on the HSE website devoted to asbestos. It is designed to provide information that will be of interest to employers, asbestos contractors and others with duties under asbestos regulations, workers currently at the greatest risk from exposure to asbestos and those who may find asbestos in their home. Click here to visit the asbestos section of the HSE website. ARCA is the leading trade association in the field of asbestos management services. ARCA work with enforcing authorities and member companies to ensure continuous improvement in standards, quality, safety and efficiency. 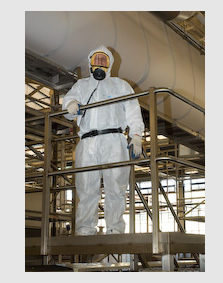 Their aim is to promote the growth and image of the UK’s asbestos industry. The Royal Society for the Prevention of Accidents is a registered charity. Its aim is to campaign for changes, influence opinion, contribute to debate, educate and inform. RoSPA is actively involved in the promotion of safety and the prevention of accidents in all areas of life - at work, in the home, and on the roads, in schools, at leisure and on (or near) water. RoSPA run occupational training courses on asbestos awareness, Click here for more information on occupational health and safety issues. An organisation with 130,000 members worldwide RICS provides information on land, property, construction and related environmental issues. Their aim is to promote best practice, represent consumers’ interests and provide impartial advice to society, businesses, governments and global organisations. The NFDC is represents the UK demolition industry, its member’s account for over 80% of the demolition that takes place in the UK. The aims of the organisation are concerned with continuous improvement in safety procedures; representation on matters affecting the industry from wage rates to site safety and developing training courses. Constructionline is the UK's register of pre-qualified local and national construction and construction-related contractors and consultants. Constructionline gather and assess pre-qualification information on behalf of over 1,700 public and private sector buyers and provide them with access to over 13,500 fully accredited suppliers free of charge. JMP Services is listed as an accredited supplier on Constructionline.